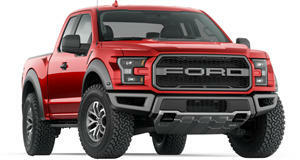 Having a real pro push the Raptor to the limit begs us to reconsider how tough this truck really is. It’s in our best interest to tell you that auto journalists are a thorough bunch, testing cars to the best of our abilities and reporting our findings back in an entertaining and informative way. The only issue with that statement is that many times, our abilities aren't honed to the extent that they should be to fully explore vehicles with limits far into the outer regions of what’s normal. That’s why Jonny Lieberman asks for help from a top professional for his latest test. Freshly back in California after spending time testing a Jaguar F-Pace in the snow, Lieberman is now behind the wheel of a Ford F-150 Raptor. Though it’s priced to allow those without a budget for an actual Baja racing truck to get the full experience, the Raptor has limits that most of us will never reach without flipping the 2.5 ton truck. That’s why Lieberman tosses the keys to one of our favorite vehicular madmen, Ken Block. Block is no stranger to the Raptor, having taken Ford’s first generation Raptor through the snow with tank tracks in place of wheels. Block now gets to wield 450 horsepower and 450 lb-ft of torque, all pushed through a 10-speed automatic built by GM and Ford after the two made a truce, in the desert. Cushioned by Fox Racing shocks, Block takes the place of Motor Trend’s usual racing driver Randy Pobst and gets a more accurate review and of the truck all while scaring the crap out of poor Jonny and giving us a better idea of what the Raptor is capable of.